It was such a rare experience. Last time I had this kind of meal it was around seven years ago in Bali, at Conrad and Gado Gado. I'm glad that I agree to accompany Aswin to his conference welcoming dinner, because he said that they lack people in the room. I thought it just like usual with the buffet and all. 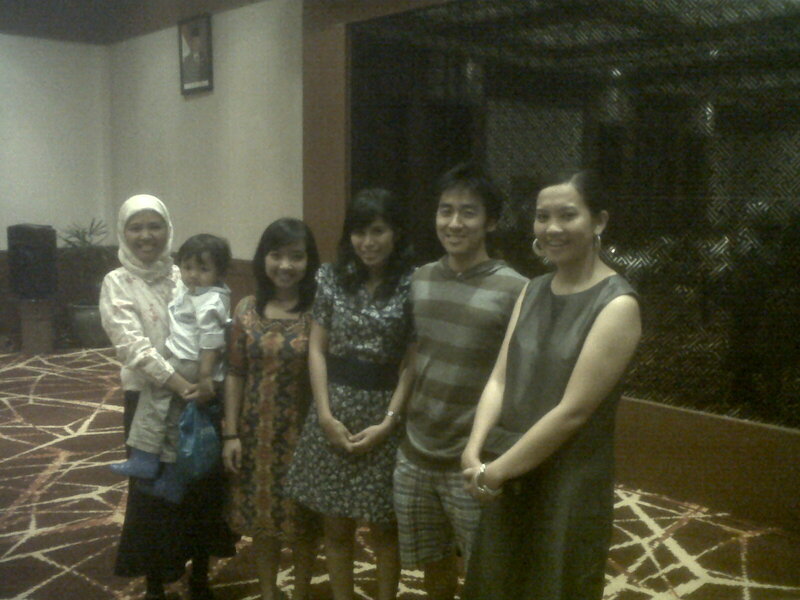 So, it was full course dinner with two appetizers, main course and dessert. The name of the food reminded me the food in the television show like Masterchef and Hell's Kitchen. I was excited but of course elegantly. 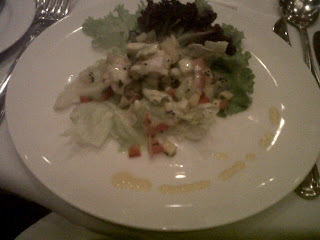 The first appetizer was salad with fish. I never taste fish in a salad, except for tuna. The taste was superb, this kind of taste that Gordon Ramsey said in Masterchef, rich of taste and so on. There's a slight of sweetness and sourness. Soup was the second appetizer. It was tomato soup. It was like the combination of tomato juice with pasta sauce, fresh yet has the exact sourness and the cheese in the soup was brilliant. 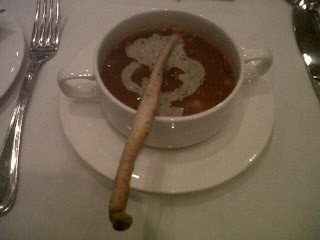 This is the first time I ate tomato soup and it was great experience. 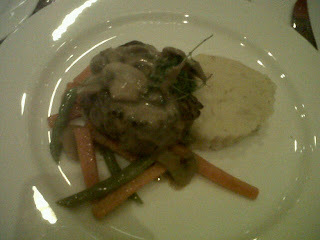 The main course was steak with mashed potato and mushroom sauce. It was cooked medium rare, so when you cut the meat then you can see that the color of the meat was still red -just like in Masterchef :) It taste great, remembering me the kind of steak that I had in Gado Gado. That was how steak should be. The meat melted in your mouth and the taste indulge you. Next, the dessert. Well, I'm not too fond of the pudding. The taste was quite blunt. But, when I try to do what the chefs always do in Masterchef when they the taste the food. 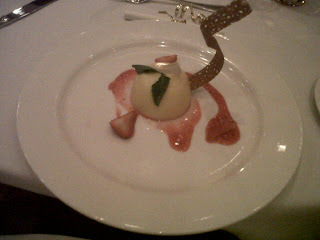 I ate the pudding, tuille (biskuit), and the sauce together and the taste was better. But still it was no good comparing with the dessert I had in Loewy.